will get some more wire ones done after some more bits are added..
not hip on warhammer, but that's a very good looking vehicle you've made. Off to a good start there. It looks like there are a bunch of shading errors in that last pic though. Your mesh looks very clean - are you hiding triangulation with ngons? not that im aware but im not sure i would know if i was lol im still very new to modeling high res stuff , though i have noticed that sometimes when an objected is unselected that more lines appear than if i was to select a part and i dont know why .. i did clean up the surface lines a lot due to mistakes so once a part was right i would remove surplus lines ect.. could this have cause it? I'm not overly familiar with Max, so I'm not sure what it was you did to "clean", but you can clearly see the actual mesh on the left and the masking of that with ngons on the right. There is definitely some cleaning up that needs to be done to get a nicer poly flow and eliminate the shading errors. 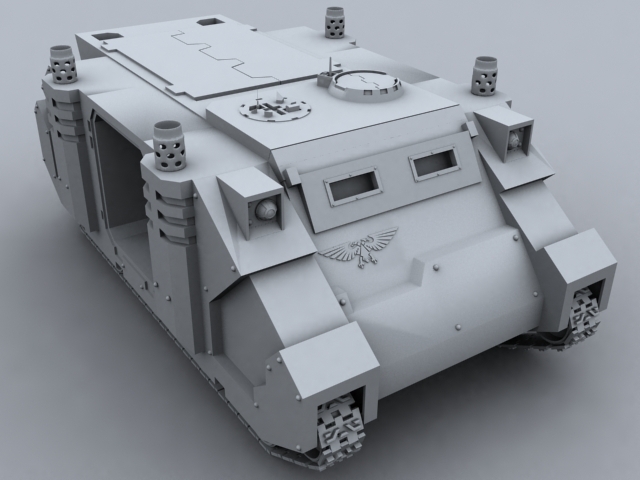 Have a look at Binkerman's Land Raider (and other 40K vehicles) wires to see the sort of thing you should be aiming for. I'm terrible at it myself, so use mine as example of what not to do. LOL will defiantly check out both yours and binkermans work as im always looking for inspiration and guidance to see the best way to achieve the results i want..
had a look through both DCB and Binkermans 40k models DAM im in awe seriously the amount of detail astounds me..
yet another update lol the inside is starting to take shape, just some detailing to the console and the storage (i assume they are) boxes at the back and the pipe on the wall needs to be remodelled more accurately. 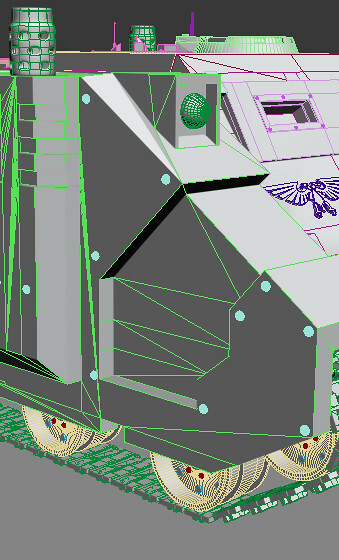 i have done some refining to the center external section and the turret hatch stack has been remodelled to a more accurate shape. 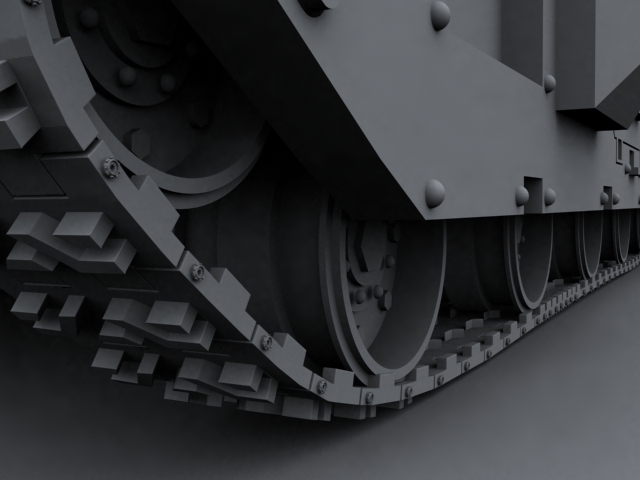 after 2 days playing with massfx since they removed reactor from 2012 i just cloned the plate and path deformed it, i know i have too may plates as seen that the bottom where it overlaps but i feel its lost its tank edge to it since its more curved, what do people think? 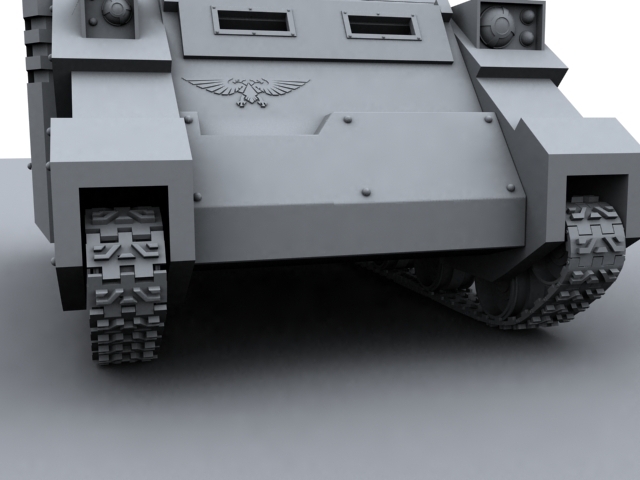 should i just go back to a more simpler less curved path around the wheels? 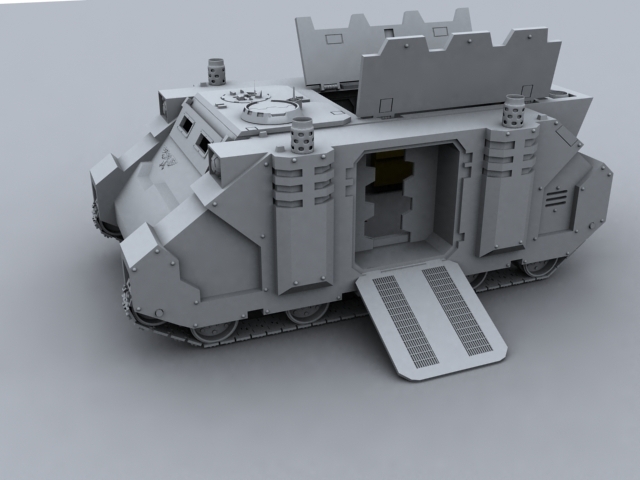 im gonna go back and remodel the plates and make them less detailed as my pc chokes up to a crawl with around 85 on one side as i have now..
Why does everybody seem to pick the Rhino as there entry into Warhammer 40K modelling (me included)? Mine was the Dreadnought, I think. Still never did a Rhino. 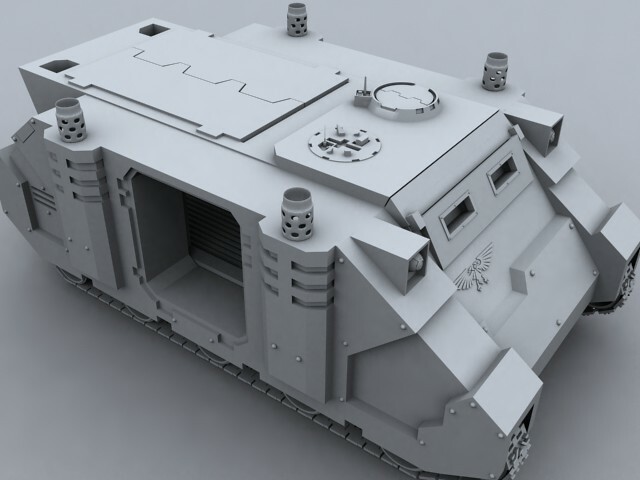 BUT, it is the basis for many other Space Marine tanks, so once you've done the Rhino you can do the Razorback, Predator, Damocles, Whirlwind, Immolator, Exorcist, Repressor and of course all their variants, chaos tainted versions, Ork looted versions and all the chapter specific sprues. 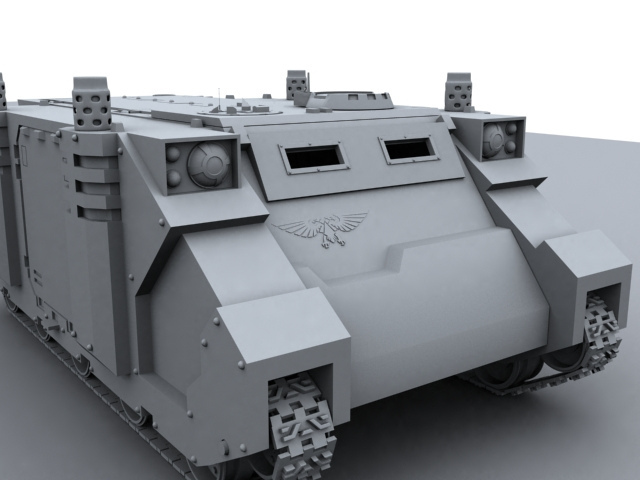 It's a tremendously flexible piece of tank if you want to build your own CG armour unit. 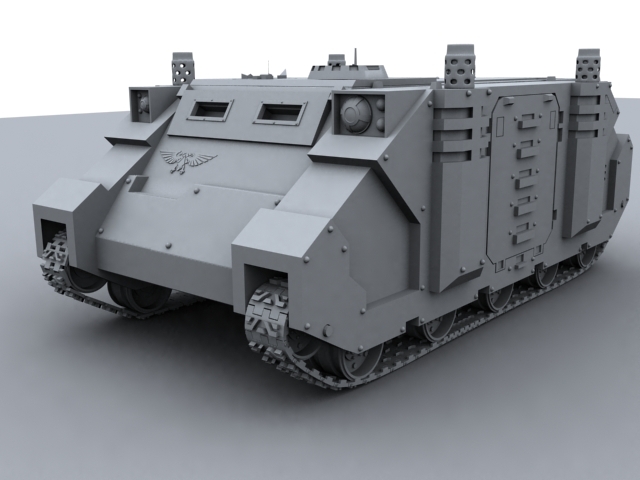 A similar thing goes for the Chimera (which you don't see much of in 3D work) and Leman Russ chassis. It just so happens that GW's sound business strategy of minimising costs and maximising profits by reusing as many of the same components as possible in different model kits ties in very nicely with the fluff notion of STCs and armed forces maximising production capability. Concerning the two different approaches to the tracks, I prefer the rounded one myself - looks more realistic. The other one is probably more representative of the miniatures though, if that is what you are going after. Personally, I was never big on slavish 1:1 replication for my own 40K dabblings, just something that was reasonably representative. Shhhh, we don't talk about that! lol, GW hit squads are twitching their eyes. But good build man, looks great. Personally I agree with DCB's philosophy. GW models are somewhat *cough* skewed in proportions due to the scale. I feel it always looks better if you take the leeway in design to make it more real-like and functional. It will look better in the end. Nice work, wolfie! 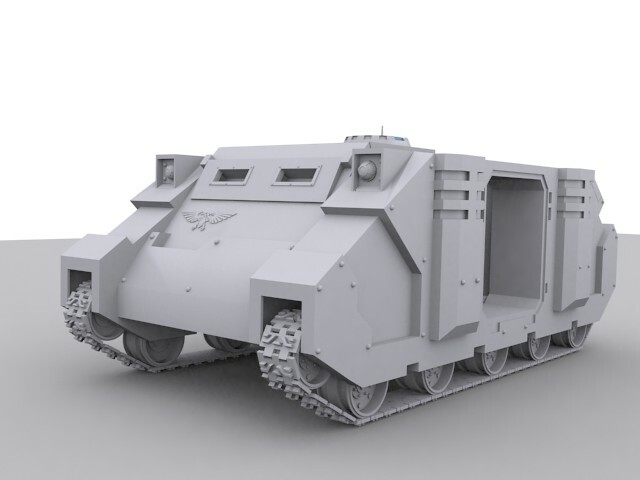 Nice to see another Rhino build in progress! Mine sort of stalled out when I got to the UV / Texturing part, but I hope to get back to it someday soon... Modo now has some nice painting tools, so I'm hoping to use those when I find the time to learn them, LoL... keep up the great work! ill be interested to see how you get on with texturing your rhino alpha - im really not looking forward to texturing any model i do, i mostly just use mental ray or previously vray textures applied to an object, but my *mapping* has been limited to reaplying poser textures to models ie SKIN as an SSS material..
A Rhino shouldn't be too hard to map and texture - it's a nice big lump of square blocks. Actually, this is something I've been wanting to try for some time, with brush-strokes, highlighting and everything. 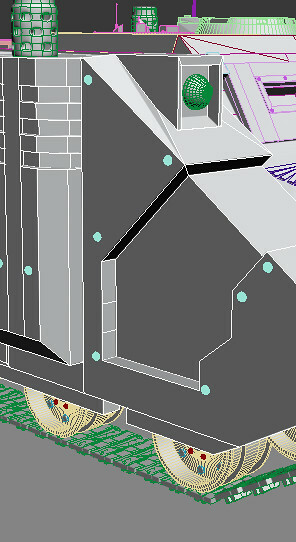 But unfortunately it would all be in the texturing - something that I'm heavily allergic to. 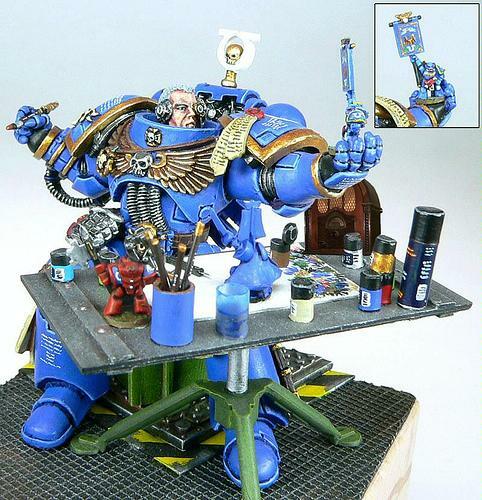 And of course, if we take *ahem* some people's painting standards we may as well just skip it and go straight for realistic. 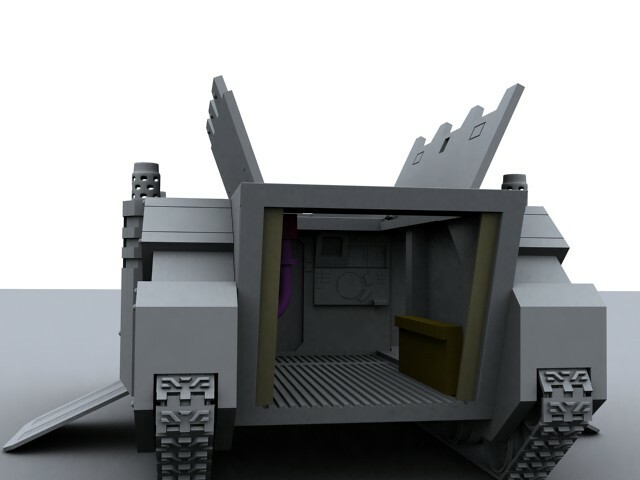 small update, done a rough interior door and have remodeled the central section still need to cut a new back door into the structure finalise where the interior doors are going to sit and slide in and out of..
hope to get this finialised over the coming weeks. Your mesh looks good. I don't know anything about the subject matter but I do have a question for you about your vehicle. There appears to be barely enough room for the road wheels under the hatch. 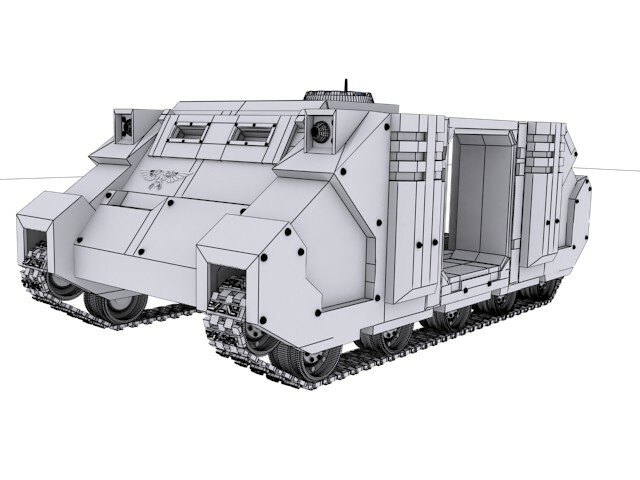 There is no room for them to actually do their job (moving up and down to absorb uneven terrain bumps - shock absorber). There also doesn't seem to be any room for the track to go over the road wheels if you think about how thick the metal plates that make up the vehicle have to be, even if it were only and inch thick. If the track is routed up and over the hatch there is also no room for them there due to the thickness the metal plating would have to have. So how does it work? as you can see the actual model there is very little room for the wheels to adapt to the terrain.. This is 40K. Best you don't ask questions about such things, lest your musings tear open a hole in the fabric of space into the Warp and allow through a swarm of cackling daemons that will devour your body and imprison your soul for all eternity.